As co-morbidity and the prevalence of chronic non-communicable diseases (CNCDs) continue to rise globally, it is hugely important to examine what this trend tells us about the health systems we have built and how these systems will respond in the future. The challenge for a person to manage a chronic condition goes beyond the disease and symptoms. At an individual level, living with a chronic condition often means that we move from a state of complete wellbeing to a situation where acute exacerbations, relapses and recurrent events push people to constantly adapt their life according to the course of the disease. Living with, and managing, such a condition also entails finding a balance between the biomedical, functional and social spheres. Traditionally, we tend to focus on disease and care rather than on what people value in terms of autonomy, functionality and social participation. From a healthcare delivery perspective, long term care for chronic conditions differs significantly from the reactive and episodic model of care that characterises many of the traditional ways health services are delivered for acute conditions. To create a strategy to tackle this growing burden placed on health systems we should therefore adopt a holistic approach that incorporates the various dimensions that shape health seeking behaviour, patient-provider interactions and social participation. The treatment and care of patients with CNCDs require sustained action at all levels of the six World Health Organisation (WHO) building blocks of heath systems: service delivery, health workforce, information, medicines, financing and governance. The figure below is an example of an ecological model of what could be seen as a comprehensive strategy to tackle CNCDs. The main drivers of NCDs are represented on the left side of the framework. Whilst people suffering from chronic diseases may have been genetically predisposed to diabetes or cardio-vascular disease, biomedical and lifestyle explanations cannot account for, among other things, why so many people around the world are becoming physically inactive and eating unhealthy diets. But as a result socio-economic factors are increasingly shaping the chronic disease epidemic. Source: Bovet, P., & Paccaud, F. (2012). Cardiovascular disease and the changing face of global public health: a focus on low and middle income countries. Public Health Reviews, 33(2), 397-415. Urbanisation, mechanisation of work, global marketing influencing social norms and lifestyles are the root causes of the CNCDs burden mediated through biological and behavioural risk factors. 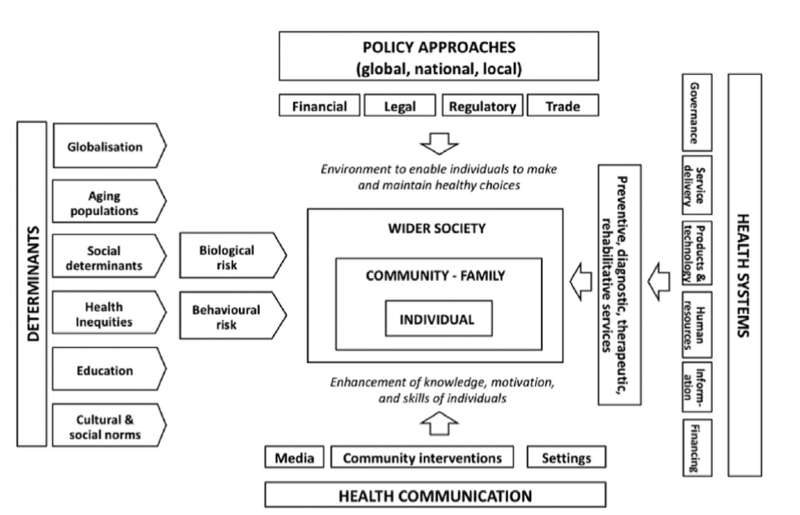 Here, the ecological approach has highlighted that focusing on intermediary or distal risk factors without considering the wider environment in which individual choices are made would be counterproductive and ultimately unsustainable. In a pluralistic – and often under-regulated environment – there is a skewed response toward quick fixes that favour investments in healthcare provision without considering other policy options aimed at tackling the determinants of CNCDs. At the same time, the lack of resources and investments in many low-income countries (LICs) makes it very difficult to envisage how a government would be able to respond to the growing demands placed on a healthcare system, while donor countries still have a tendency to favour options that call for a focus on preventive measures. After years of neglect, world leaders recognised the compelling case for action with the declaration at the United Nations meeting on non-communicable diseases in September 2011. Since then, the WHO has been developing a Global Monitoring Framework and a Global Plan of Action that would support member states tackling non-communicable diseases and realise the commitments made by adopting the Political Declaration of the United Nations General Assembly for prevention and control of NCDs. However, despite growing evidence on what works and identification of cost-effective interventions, political leaders in LICs still face difficult decisions about where to invest resources along the causal chain of disease. While global prescriptions and normative statements have flourished, the operationalisation and contextualisation of the global CNCD discourse is still a work in progress.